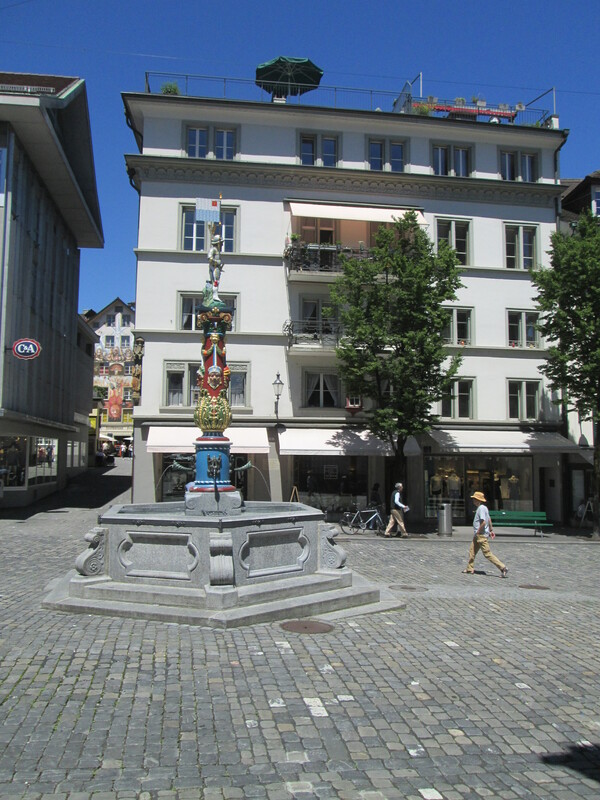 Lucerne is on a beautiful lake and has hills and mountains right on the doorstep, but with only a few hours to spend, we stayed in the town. 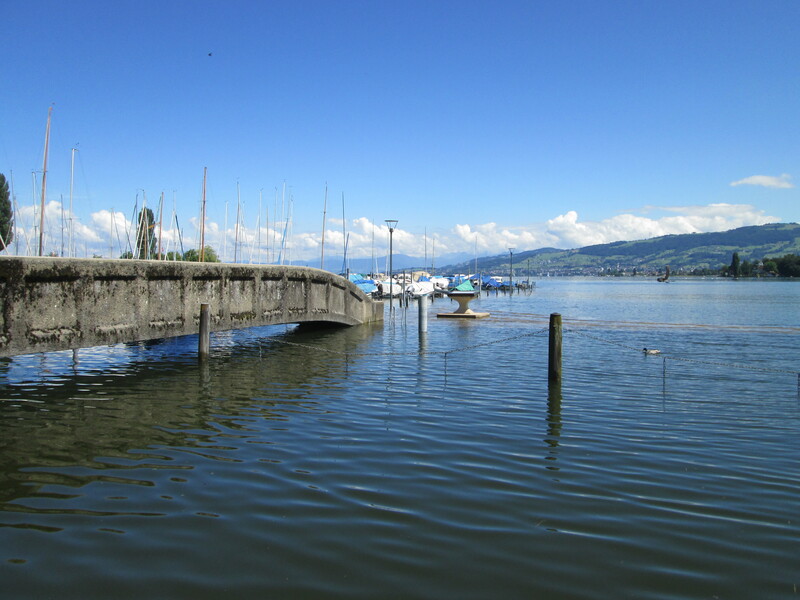 The photo above shows the wooden Chapel Bridge, which burned almost completely in the 1990s and was rebuilt afterwards. I saw it the following year when it was still new and somehow gauche-looking, but now it’s weather-beaten and ‘old’ again – much better! Here’s a view from further down the river. 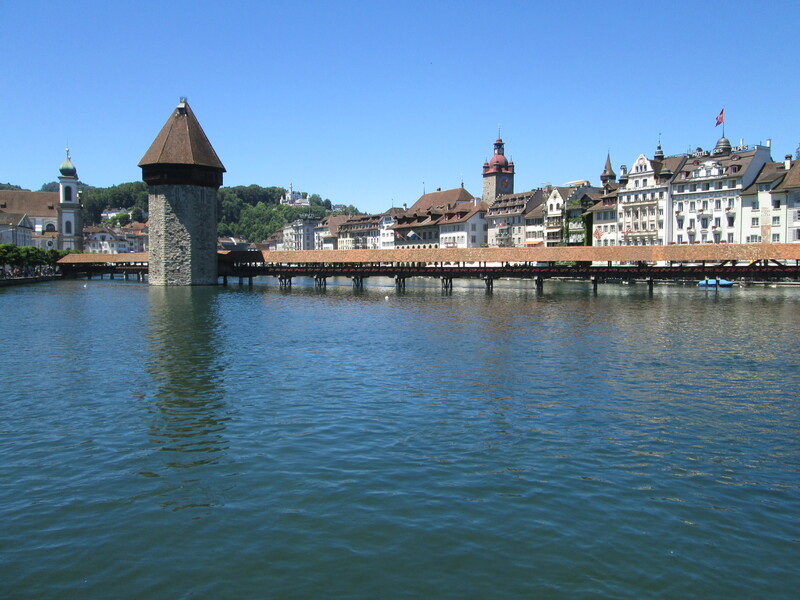 For info and more lovely Lucerne pics click here and then on the edge of the large photo. Our own Lake Constance at home in N.E. 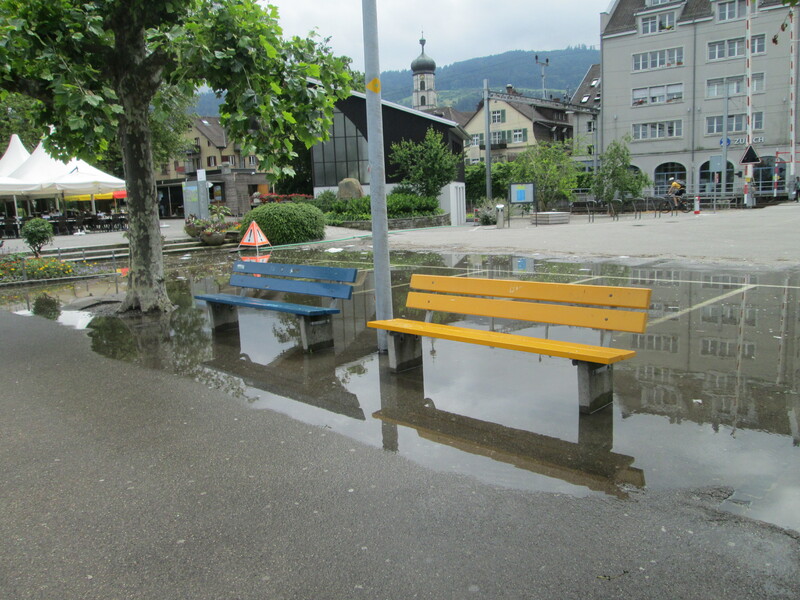 Switzerland is still very high – parts of the lakeside are inaccessible now. As floods go, it’s a very mini one, but it still makes life complicated. The good news is, ‘they’ are saying the water level should start falling soon. It’ll be nice to have the lake back in the lake again! 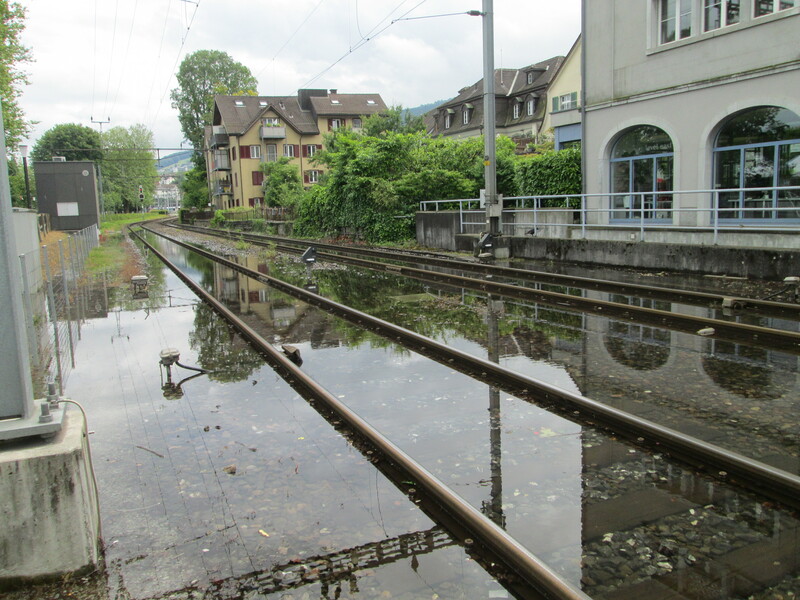 This entry was posted in Life in Switzerland, travel and tagged floods 2016, Lake Constance, Lake Lucerne, Lucerne, Switzerland. Bookmark the permalink. So…after the vote… Do you have a spare room? I do, but there’s quite a long queue for it at the moment… Emergency choc parcels can be sent too. 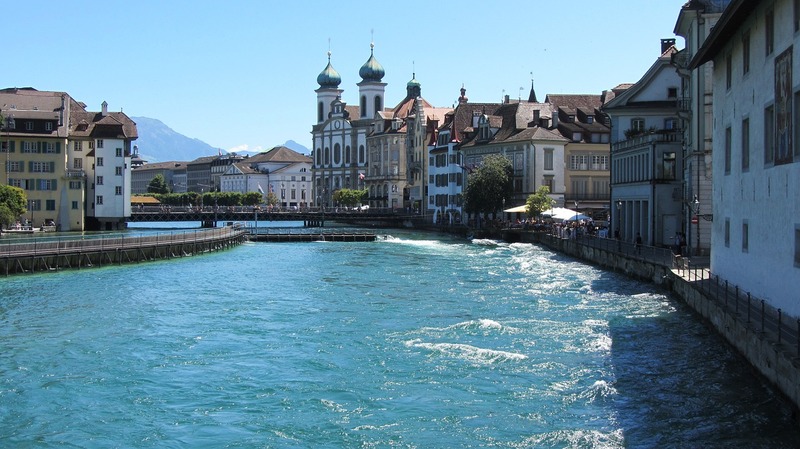 Lucerne looks gorgeous. Lovely photos. Linda. I hope they’re right about the water levels. 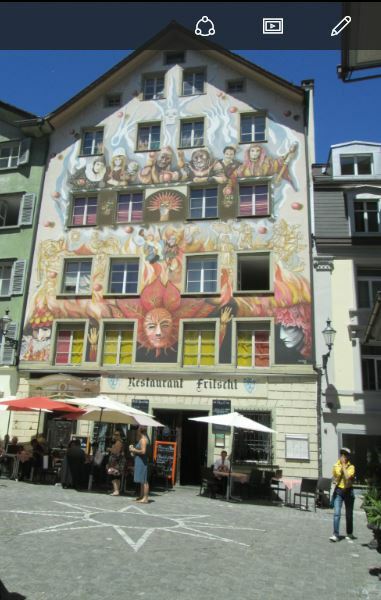 Thanks, Cathy – it’s a fabulous place to visit. My fingers are firmly crossed for our water levels too! Gorgeous pics, Linda (except for the floods). 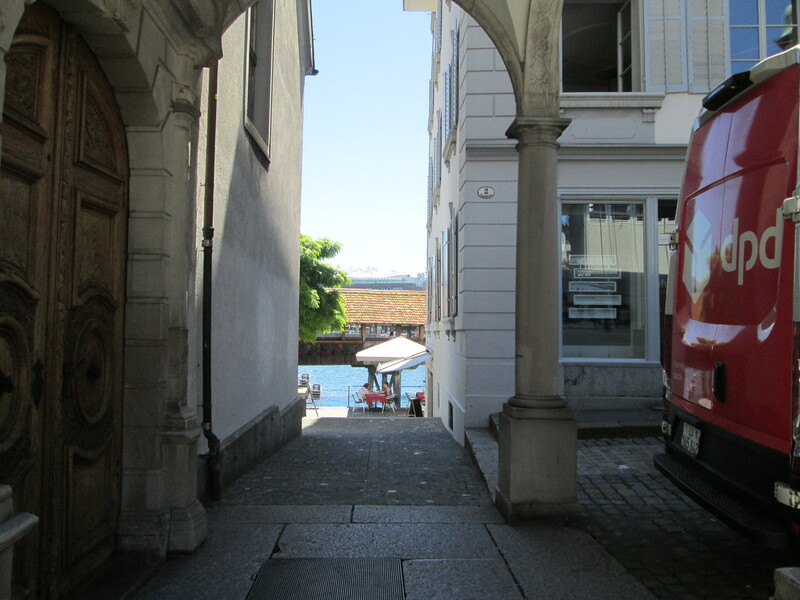 I was in Lucerne for a day once in . . . oh, 1983! Long time ago, but I remember thinking it was lovely. Time you went back! It’s very picturesque, and the surrounding hills and mountains are easy to get to.